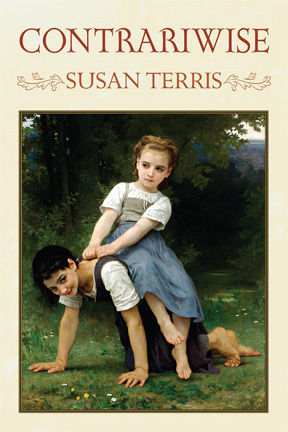 The following poem is my interpretation of the William Bouguereau painting on the cover of CONTRARIWISE. –S.T. Yet I've been here so long, and lunch was only for him. Pear, I think. If I am good, he may give me one for myself. And Psyche, I listen but beneath me I feel moving bones. I am trying not to fall. Peach, I think, or a few centimes. You look, he tells me, like a Raphael angel. But I don't know any M. Raphael or any angels. Now I am falling. Plums, I think, or a pair of new shoes. And something is itching up between my legs. What I'd like, maybe, is a pomegranate or a dog. And I want to get off. I need to make pipi. Biscuits, I think, and buttermilk. But only if I'm good. Of the other girl — Chérie, she's called — my body, too. Again, he tells me, I have the face of an angel. When I grow bigger and rounder, he will paint me again. Clothes, he tells me, and I think I might have to die first. Or maybe, old smelly man that he is, he will. CONTRARIWISE is a book about men and women who are or were obsessed in one way or another with the lives of children. It begins with John Ruskin and Lewis Carroll and ends with Vladimir Nabokov. In between you’ll find poems about writers, painters, photographers, dancers plus short poems about flowers, which—in one way or another—are also about young boys and girls. –S.T.